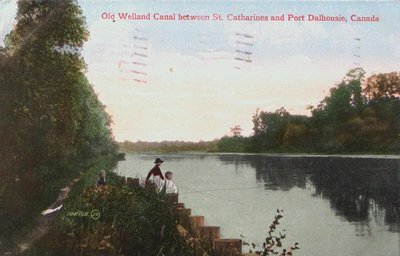 A postcard of the Old Welland Canal (Second) between St. Catharines & Port Dalhousie, Ontario. Postmarked September 25, 1909. Published by the Valentine & Sons Publishing Co., Ltd. Montreal & Toronto. Printed in Great Britain. The Valentine & Sons Publishing Co., Ltd.